The widespread process of urbanisation, its exertion into new territories and its transformation on existing settlements is creating new contexts with unique spatial characteristics, impacting villages, social structures, economies and built form. Rural Urban Framework focuses on sites at the frontline of this process, in the hinterlands and peripheral areas where the effects of urbanisation are beginning to take hold. The lecture will investigate four contexts in which we work. The first is the unique context of our practice, operating within the University as a lab conducting design projects as research explorations. The second is the transformation of the Chinese countryside and changing relationship between the urban and the rural. The third context is the gerdistricts of Ulaanbaatar, Mongolia, which are extensive settlements of felt tents or gers, resulting from migration of rural nomads moving to the city. The final context is neither village nor city, an empty site where we had to construct our own context in which to work. In each location we will describe design concepts and methods we have used in the design process to create buildings, material prototypes and urban strategies. Joshua Bolchover and John Lin set up Rural Urban Framework (RUF) as a design and research lab at the University of Hong Kong. Over the past 10 years RUF has focused on sites impacted by the dynamics between urban and rural transformation. Currently we have been working in two very contradictory contexts: the impact of urbanisation in rural China, and the impact of rural nomads settling in the city of Ulaanbaatar, Mongolia. The projects include schools, community centers, hospitals, village houses, bridges, and incremental planning strategies. As a result of this active engagement, RUF has been able to research the links between social, economic, political processes and the physical transformation of each village. The projects integrate local and traditional construction practices with contemporary technologies. RUF has received numerous international awards including The 2016 RIBA International Award for Emerging Architect, The Curry Stone Design Prize in 2015 and the Ralph Erskine 100 Years Anniversary Award 2014, given for innovation in architecture that “primarily benefits the less privileged in society”. RUF is also the winner of Architectural Records Design Vanguard and the ICON Award Emerging Architectural Practice of the Year in 2013. The House For All Seasons, a rural house prototype built in Shaanxi Province, China is the overall winner of the Architectural Review’s House Award in 2012, the WA Chinese Architecture Award 2012 and the Wienerberger Brick Award 2014. 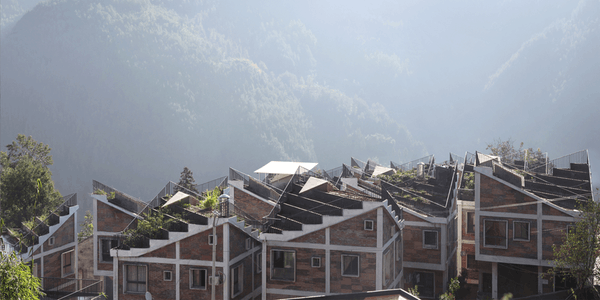 Other notable projects include high commendation in the AR Emerging Architecture Award for Qinmo Village School 2009, Taiping Bridge Renovation 2010 and Tongjiang Recycle Brick School 2012. Publications include Border Ecologies: Hong Kong’s Mainland Frontier (Birkhauser 2016), Designing the Rural: A Global Countryside in Flux (Architectural Design 2016), Rural Urban Framework: Transforming the Chinese Countryside (Birkhauser 2013) and Homecoming: Materialising, Contextualising and Practicing the Rural in China (Gestalten 2013). Their projects have featured in DOMUS, MARK, Architectural Record, Architectural Review, A+U, and FRAME. Recent exhibitions include Settling the Nomads at the Venice Biennale 2016, Fear and Love at The Design Museum London 2016, and The Chicago Biennial in 2015, the MAK Vienna in 2013 and in “Participatory City: 100 Urban Trends” at the Guggenheim, NY in 2013. Joshua Bolchover and John Lin are currently Associate Professors at the University of Hong Kong and have taught and lectured in numerous academic institutions including Columbia University, The Berlage Institute, Pratt Institute, EPFL, The Chinese University of Hong Kong; Cambridge University and the Royal Danish Academy of Fine Arts. In association with Creative Victoria as the partner for Business of Design Week, Hong Kong 2018.